One of the highest valued novels of contemporary German literature has been written by the late Wolfgang Herrndorf, whos early death in 2013 was perhaps not only the big loss of a great literature talent, but of many yet unwritten books as well. Unlike the recent death of Gunther Grass, whos most creative period ended perhaps in 1988 with his novel “The Rat”, one can imagine which wealth of phantastic and witty and lovely literary works Wolfgang Herrndorf could have given us if a deadly illness would not have taken him away from his desk forever. 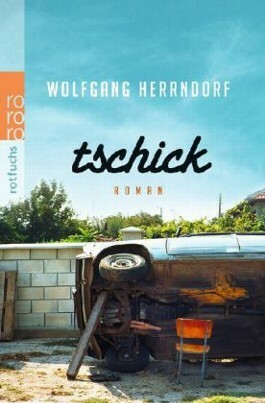 Herrndorfs most influential novel, “Tschick” is a coming of age story of two schoolboys, one from a well-established but decadent East-Berlin family, the other one a really underdog of post cold-war immigrants from somewhere in eastern Europe. The novel can be summarized very briefly, which I think is not neccessarily an indication of mising quality: The two boys are bored during their summer holidays and decide to steal an old car to drive to Wallachia (in a review in the Guardian this act is described as “they sort of borrow a car“). The magically sounding land of Wallachia lays somewhere between Ukraine and Romania and is the homeland of Tschicks, the underdogs grand parents. But instead of making their 1000 miles ride to Wallachia, they soon got lost in the post-unification waste-lands south of Berlin. There they get involved in a series of adventures, during which they experience dangerous situations, are threatened by gangsters, but also encounter moments of romantic love and philosophic reflections. The novel therefore reminded me very much of one of the greatest comming of age novels that was ever written (long before this category was coined): “The adventures of Tom Sawyer and Huckleberry Finn” by Mark Twain. Tom and Huck also had planed to go on a journey to a far away place. But instead of sailing hundreds of miles to Saint Louis, their trip ends after a few hours on a tiny island down the river. It is there where they experience the adventures that turn them from obedient school-boys into self-confident young men. The journey, even if it brings them just a few miles away from home, provides the right environment for their own test of courage. For the first time in their life they spend some nights alone under the open sky, learn how to survive outside the protective home and how find clever solutions when faced with unexpected difficulties. With a mixture of excitement and satisfaction they realize that what they really need in these nights of forbidden adventures is nothing the school and teh Sunday prayers could have teach them. The skills that become essential for survival out there are more like instinkts, and they simply have to follow their intuition. And in a similar context as the two school-boys in Herrndorfs novel, Tom and Huck learn to get along with fears. Even better, they experience the greatest moments of discovering their own strength when they don’t escape dangerous moments, but when they find a way of dealing with them. And for these great discoveries, neither Tom and Huck nor Tschick and Maik (the second character in Herrndorfs novel) need a real far journey. As soon as they get out of sight of their home town, the adventures start. I had to think about these adventure lands which may begin just beyond the last garden fence of your hometown when Cathie, a good friend of us came around recently. She inherited from her parents in the US a rather large sum of money, and uses it all now to spend on travelling around the world. About every second month she is away, seeing places such as Marocc, Bali, Thailand, India, Mexico and a lot more. Usually after each trip she comes to see us and brings a souvenir, as if she wants to show us the evidence that she indeed has been at these far places. But this more or less seems to be the only “deliverables” of her exotic journeys. With all her money and the security of an AmEx credit card and prepayed return flight, she stays outside of an adventure land. She experiences the far places as if she looks into a glossy photo book. I am not categorically against any traveling to far away places, but one should not go with the tourist streams or flocks of backpackers. And if one is not able to experience the potential adventures in your near neighborhood, you will neither find them on the other side of the world. PS: It is a pitty that although Herrndorfs novel “Tschick” has been translated in more than 25 languages, there is no english Wikipedia article on him. I think in th enext few days I am going to write one. The english title of the book is “Why we took the car“. I am surprised that the review in the english Guardian did not revealed the similarity in the narrative pattern of Mark Twains great american youth novel and this modern roadmovie, that was written more than a century later.